Thousands of Arizonans have driven to Rocky Point. It's become a hot vacation spot. And now, the road is safer due to first responder training and road repair. TUCSON, Ariz. — Thousands of Arizonans have driven to Puerto Peñasco or Rocky Point and it's become a hot vacation spot. 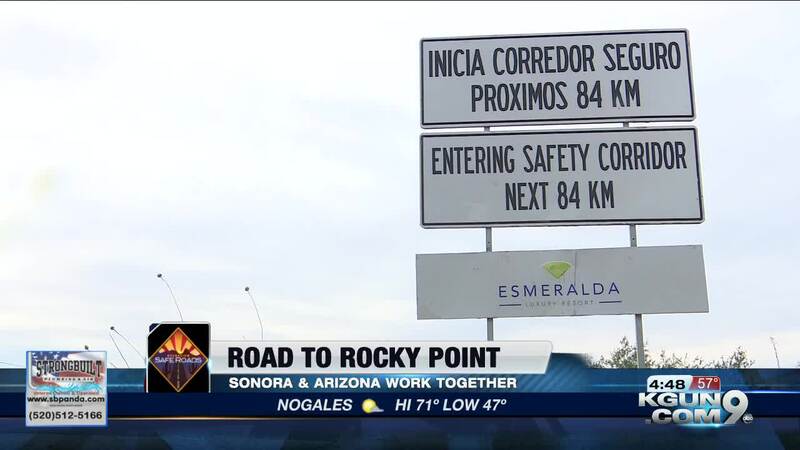 Last year, Arizona and Sonoran governments teamed up to improve the road to Rocky Point by creating a safety corridor. Driving from Tucson to Rocky Point can take about five hours but before crossing into Mexico, many drivers stop in Lukeville for a final pit stop. "I love it down there. I love the people, I love the food, I love the way the treat us, they treat tourists very nice, they want the business," traveler Dan Hurwin said. Hurwin says he loves Rocky Point so much that he splits his time between living there and in the Phoenix area. He says since both governments began working together, there has been a big difference. "The work between the Mexican government and the United States government is evident because there are signs all along the way, the roads has been improved, you have actually shoulders on both sides all the way down," he said. Signs in English and Spanish can be found all down the 63 miles of Mexico's Route 8. What was missing were telephones, which were supposed to be inside of big yellow SOS poles. Senior adviser to Governor Ducey, Juan Ciscomani, with the Arizona -- Mexico Commission, an organization working toward cross border prosperity, says there were plans to install the phones but later it was decided not to. He says Arizona's relationship with Mexico is as strong as ever and says this road is safer after first responder training and road repair training. "Another aspect of it is we have something called a 511 number, which is an information sharing line between Arizona and Sonora where Arizona travelers can get information on either traffic, weather, or road conditions." For more information on the corridor you can visit a press release ADOT sent out last year when the corridor was opened.